"I talked with Hannie McGill Simpson, daughter of Clara Culpepper McGill today. She had received the copy of the picture and had time to examine it.... She basically agrees that it is almost sure to be a picture of William Jehu and Josephine Culpepper. 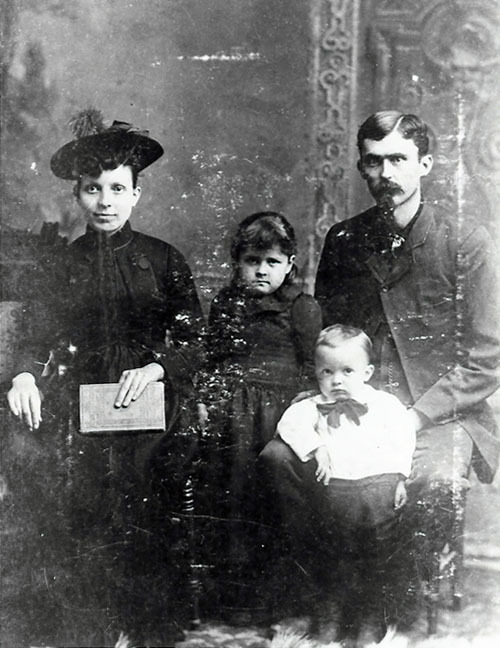 The youngest child being held by Julia should be Mary Glanton ,3. George was born in 1890 but is not here at least in the picture. If we can accept this scenario then we have left to right, Malcolm Henry Luther, Josephine Culpepper with Emily Delura, 9, standing in front of her. Julia Eldora,10, would be standing next holding a child that would be Mary Glanton ,3. William Jehu Culpepper would be standing behind Frank, 6. Carrie Eunice and Clara Earnest the twins, 7, should be the toddlers dressed somewhat alike. James Benjamin and John William , 11, the twins should be standing on either side of the horse. Biography* � William Jehu Culpepper was the son of John Malcolm and Sarah Ann Elizabeth (Stephens) Culpepper. He was noted as a two year old "William G. H. Culpepper" in the 1860 census of Almond P. O. District, to the west northwest of Louina (now Wadley) in Randolph Co., AL, and this is where he is believed to have been born. Billy's middle name is pronounced "jay'hue" and it has been variously recorded as "J. Hugh," "Jahue" and "Jehew." Possibly the 1860 census taker heard "G. Hugh" and recorded "G. H." However, Mrs. D. W. (Lavyn Wright) Sisco, a great- granddaughter of John Malcolm and Sarah Ann Elizabeth (Stephens) Culpepper and a historian for the family, wrote letter 28 Sep 1979 that Billy's daughter-in-law, Mrs. F. D. (Nora McFarland) Culpepper thought that William's middle name was "Jehu (as in the Bible)." Jehu was a king of Israel who was recorded in the Old Testament in Book II Kings as a son of Jehoshaphat, the son of Nimshi and he was noted for destroying the dynasty of Ahab and Jezebel. Based on the birth locations of children from census records, Billy moved his family to Arkansas around 1890. Unfortunately, the 1890 U. S. census records were burned. Lavyn (Wright) Sisco wrote17 that Billy is believed to have farmed in the Hurricane Creek area of Grant Co., AR. Hurricane Creek runs north to south through the eastern third of the county. 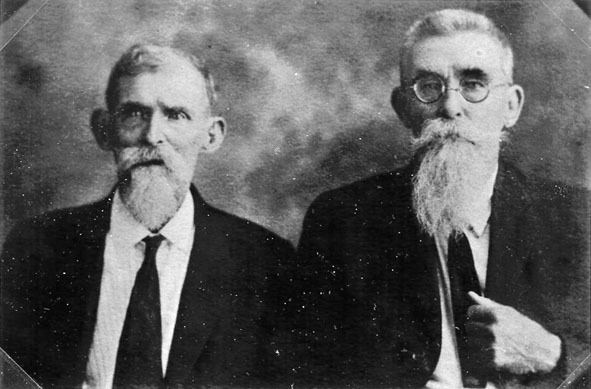 Uncle Billy Culpepper was an old man as long as folks could remember, even looked older than his father, John. He was a strong Methodist. His wife was and even-tempered woman who cared for him as though he were a child.... Uncle Billy called everyone younger than he "dear baby." No one would ask him how he felt, he always hurt somewhere. He was a farmer. 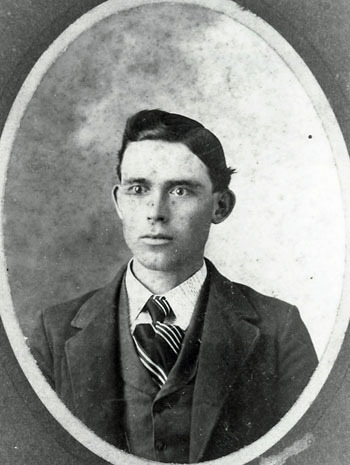 John William Culpepper, RFD#3, Como, Hopkins Co., Texas, age 39, born 6 Jan 1879, Caucasian, Farmer at RFD#3, Como, Hopkins Co., Texas, Nearest relative: Cora Agnes Culpepper, RFD#1, Como, Hopkins Co., Texas, Tall height, Slender build, Blue eyes, Dark brown hair, No disabilities. Registered 12 Sep 1918 at Sulphur Springs, Hopkins Co., Texas. 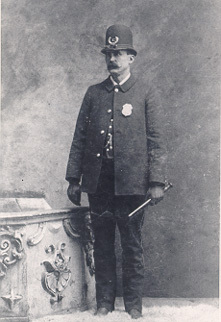 James Benjamin Culpepper, RFD#3, Como, Hopkins Co., Texas, age 39, born 6 Jan 1879, Caucasian, Farmer at Pine Forest, Hopkins Co., Texas, Nearest relative: Mary Eliza Culpepper, RFD#1, Como, Hopkins Co., Texas, Medium height, Slender build, Blue eyes, Dark brown hair, No disabilities. Registered 12 Sep 1918 at Sulphur Springs, Hopkins Co., Texas. 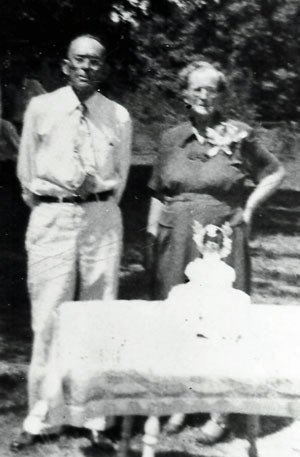 Francis Daniel Culpepper, RFD#3, Como, Hopkins Co., Texas, age 33, born 15 Sep 1884, Caucasian, Farmer at RFD#3, Como, Hopkins Co., Texas, Nearest relative: Nora Nita Culpepper, RFD#3, Como, Hopkins Co., Texas, Tall height, Slender build, Blue eyes, Dark brown hair, No disabilities. Registered 12 Sep 1918 at Sulphur Springs, Hopkins Co., Texas. GF Culpepper Sheet (Hubert Culpepper info); POB 1910 census. George F Culpepper, 27, Yantis, Wood Co., Texas. Born 24 Apr 1890 in Pine Bluff, Arkansas. Farmer at Yantis, Wood Co., Texas. Married with 1 child; Caucasian; No prior military service; Claims no exemption from service; Tall height, Slender build, blue eyes, light brown hair, not bald, no disabilities. Registered 5 Jun 1917 in Mineola, Wood Co., Texas. Robert Earl Culpepper, Como, Hopkins Co., Texas, age 22, born 14 Apr 1895 in Como, Texas, Farmer for self at Como, Texas, Wife and 7 month old girl are dependent, Married, Caucasian, No military experience, Medium height, Slender build, Gray eyes, Brown hair, Not bald, No disabilities. Registered 5 Jun 1917 at Hopkins Co., Texas. 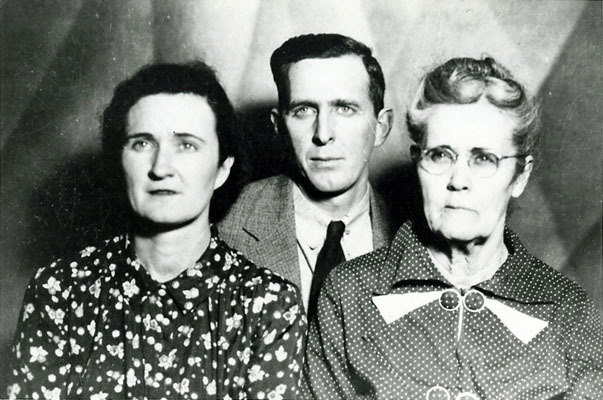 Carl Sheppard Culpepper, RFD#3, Como, Hopkins Co., Texas, age 19, born 14 Feb 1898, Caucasian, Farmer at RFD#3, Como, Hopkins Co., Texas, Nearest relative: William Jayhue Culpepper, RFD#3, Como, Hopkins Co., Texas, Tall height, Slender build, Blue eyes, Light brown hair, No disabilities. Registered 12 Sep 1918 at Sulphur Springs, Hopkins Co., Texas. Carl Culpepper, Son, M, Feb-1899, 1, S, TX AL AL. Tessie Culpepper, Daughter, F, 9, S, TX AL AL. Tessie Culpepper, Dau, F, 18, S, TX AL AL. John Culpepper, Hopkins Co., Jan 10 1927, 2255. William Jahue Culpepper Family Group Sheet. Capos Conley "Chip" Culpepper, II, A Collection of Culpeppers manuscript, in the "Additional Information on Members of The Family Culpepper" section, there is a letter of recommendation, preserved by Lavyn (Wright) Sisco, from the Methodist Episcopal Church of Pleasant Hill, Daviston, Alabama for William J. Culpepper and his family. Julia Ann Josephine East [was the] daughter of Ben and Ikasie (? Kirk) East (for a time I believed that the father of Josephine was Tom but the Randolph Co. Census of 1870 names her as Emily East with correct siblings in Fairplay Township. She was 13. This was six years before her marriage to Billy Culpepper. Her brother was named Tom.) Actually Ben East married twice. Josephine was the youngest child from his first marriage. Her full siblings were named Bill, Laura, and Mary. His second wife's maiden name was Susan Duke. 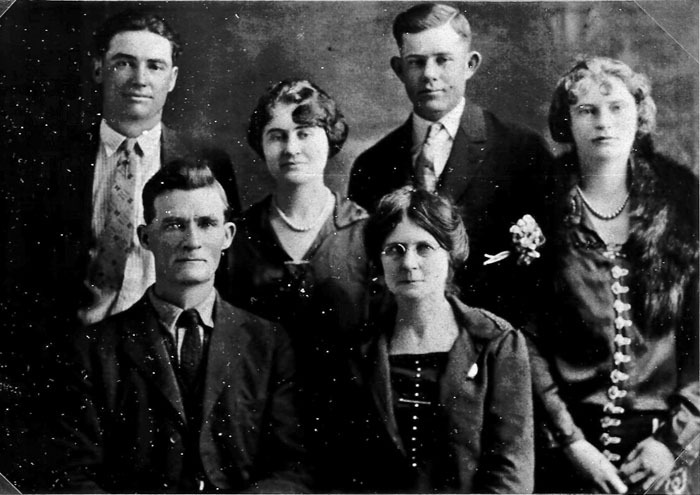 Their children's names were Jim, Richard, John, Wyatt, Mitchell, Tallie and Thomas Elias. 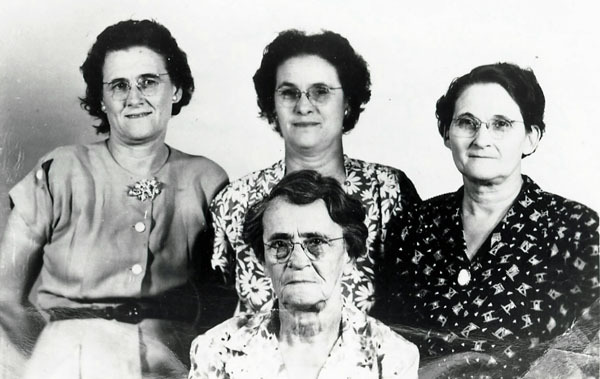 According to the 1910 census record, "Emily J. Culpepper" gave birth to 17 children during 34 years of marriage. William Jehu Culpepper announce new arrivals by saying that he and "Miss Jo" had "done wrong again. "13 Only 16 of the 17 children have been identified and only 14 were still living in 1910. The Billy [William Jehu] Culpepper family donated the bell for the bell tower. Once upon a time the bell hung in the back yard of the Culpepper home. Ringing the bell was Josephine Culpepper's way of telling the family in the field that dinner was ready. Franklin East by his second wife. My mother knew her well. She pronounced the name but did not know for sure how to spell it. So I can only suggest you keep an eye to names that sound like it to be sure. For purposes of this discussion I am going to call her Ikasie Kirk East. She could indeed have had another name like Lucy but I do not have that information . Lucy's age would place her two years younger than Benjamin which would work well. She married Benjamin Franklin East who was born Nov. 15, 1834. I do not know Ikasie's birth date unless she is Lucy. Benjamin Franklin East married for the second time Nov. 4, 1858. So Ikasie must have died when my grandmother Emily Julia Ann Josephine East was very young infant. I do not know if the birth had anything to do with Ikasie's death or not. I have seen a census for 1860 that shows a definite reference to the baby about age 2 Emilie Julia Ann Josephine both in the home of J.P. Kirk and in the home of Benjamin East and his new wife Susan. Evidently the census taker came at different times and both the grand parents and the birth father counted the child that was my grandmother. The grandparents must have helped take care of the child between the time of the death of Ikasie and Benjamin's new marriage. Culpepper and Josephine East were married in the home of J.P. Kirk and the ceremony was performed by William Henry Culpepper the grandfather of Billy. I asked Mr. Hoyt Kirk once specifically if he knew of a connection with my grandmother's relatives and those of John Wesley Kirk. He was not able to shed light on it then and of course if I had mentioned Lucy he would probably have known. 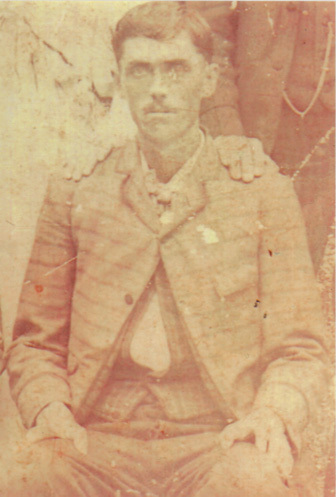 Biography* � John Francis Culpepper was the son of John Malcolm and Sarah Ann Elizabeth (Stephens) Culpepper. He was born and raised in Randolph Co., AL. Sometime after the 1880 census, Frank's parents went by wagon train to Grant Co., AR and Frank is presumed to have gone with them. They were looking for good farming land.... Uncle Frank returned to Ark.7 and didn't return. E-mail written Sep 2009 to Culpepper Connections from Ryan Kent Culpepper (#23620), e-mail address. "Peterson v. Culpepper", 20 Feb 1904 decision by the Arkansas Supreme Court. Pine Ridge Cemetery, Grant County, Arkansas, contributed for use in the USGenWeb Archives by: William W. Henry. Biography* � Daniel Elias Leslie Culpepper was the son of John Malcolm and Sarah Ann Elizabeth (Stephens) Culpepper. He was born after the Civil War and raised in Randolph Co., AL. Sometime after the 1880 census, Dan's parents went by wagon train to Grant Co., AR and Dan is presumed to have gone with them. Biography* � Robert Henry Luther Culpepper was the son of John Malcolm and Sarah Ann Elizabeth (Stephens) Culpepper. Luther was noted as a one year old "Robert Culpepper" with his parents in the 1870 census of Louina P. O. District, Randolph Co., AL and this is where he is presumed to have been born. This district was in the area of what is now known as Wadley, AL. Sometime after the 1880 census, Luther's parents moved the family by wagon train to Grant Co., AR, then, in 1892,("Beautiful Tribute Paid to Uncle John Culpepper" unknown source, presumably a Hopkins Co., TX paper, circa 12 Jan 1927) Luther went with his parents and their two youngest children by train to Saltillo, Hopkins Co., TX.(Mrs. D. W. (Lavyn Wright) Sisco, "John Malcolm Culpepper," typed sheet and letter 15 Apr 1994) In 1895, Luther married Annie Elizabeth Forgy and they settled down to raise their family near Saltillo, TX. Mrs. D. W. (Lavyn Wright) Sisco wrote: (summary of the children of John Malcolm Culpepper) Uncle Luther Culpepper was a rustic fellow. He settled near Saltillo (Hopkins County). When all the relatives came on the train, they always stayed with Uncle Luther. Uncle Luther built a house when he first came to Texas. His youngest daughter purchased the farm when she married. She reared her family in the same house and tore the original house down within the last five years. Luther died in 1921 at the age of 51. ======================= A 41 year old Luther was listed in the 1910 census of Hopkins Co., TX (ED 60 Sheet 217) with his wife and older children. John Culpepper, Father, M, 84, Wid, GA SC SC. Mary Culpepper, Dau, F, 12, S, TX AL MO. 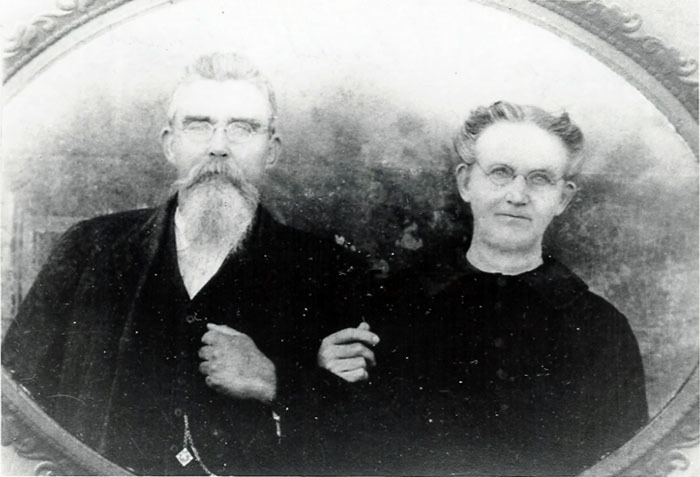 Biography* � Sarah Ann R. Culpepper was the daughter of John Malcolm and Sarah Ann Elizabeth (Stephens) Culpepper. Her parents were noted in the 1870 census of Louina P. O. District, Randolph Co., AL and this is where Sally is presumed to have been born. This district was in the area of what is now known as Wadley, AL. Sometime after the 1880 census, Sally's parents moved the family by wagon train to Grant Co., AR. In 1889, Sally married George Franklin Hill. The couple was noted with their infant daughter in Sulphur Township, Grant Co., AR in the 1900 census records. However, based on the birth location of the next child, the family moved to Hopkins Co., TX by 1902 and this is where they settled down to raise their family. 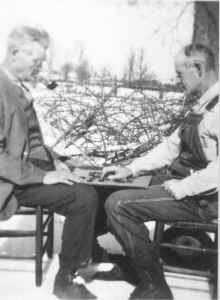 According to Mrs. D. W. (Lavyn Wright) Sisco,4 their farm was "one mile southwest of the J. C. Bradford farm." Mrs. J. C. (Nancy Gillespie Culpepper) Bradford was Sally's younger sister. p 57; location Lavyn (Wright) Sisco letter 15 Apr 1994.
p 57; POB based on 1900 census. Biography* � Nancy Gillespie Culpepper was the daughter of John Malcolm and Sarah Ann Elizabeth (Stephens) Culpepper. Her parents were noted in the 1870 census of Louina P. O. District, Randolph Co., AL and this is where she is presumed to have been born. This district was in the area of what is now known as Wadley, AL. Sometime after the 1880 census, Nancy's parents moved the family by wagon train to Grant Co., AR. Nannie Bradford was an even tempered woman. She married James (Jim) Bradford. Jim Bradford was one of the best farmers in the county. His first seven children were girls and each could plow with mules as well as any boy. The Bradford home was a gathering center. There were always birthday dinners, Easter egg hunts, watermellon cuttings and Jim was always 'it' in the first game of blindman's buff. All preachers and peddlers were welcome to spend the night at the Bradford house. Biography* � Melvina Miriam Culpepper was the daughter of John Malcolm and Sarah Ann Elizabeth (Stephens) Culpepper. She was presumably named for two of John Malcolm Culpepper's sisters but she went by the name "Mattie Myra." She was born in Randolph Co., AL but, sometime after the 1880 census, her parents moved the family by wagon train to Grant Co., AR. 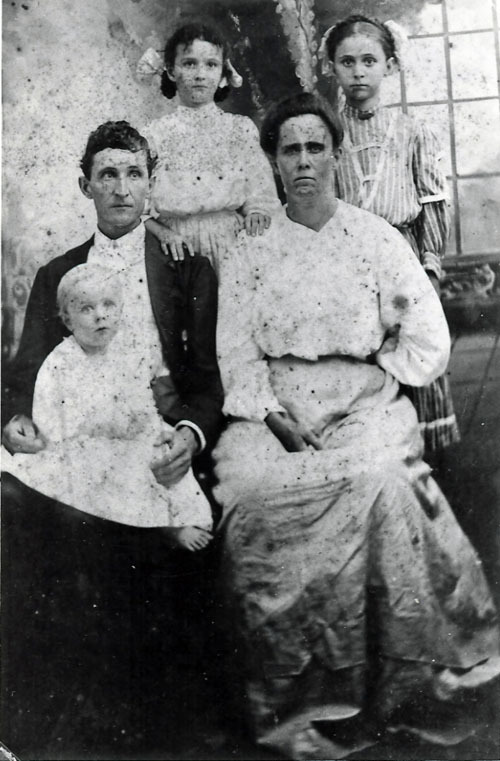 In 1892,4 Mattie Myra's parents took her and her younger brother along with her older brother, Luther, and went by train to Saltillo, Hopkins Co., TX5 where they settled down in the Pine Forest Community. There Mattie Myra met and married Ed Minter and they are noted with their young family in the 1900 census of Hopkins Co., TX. Mrs. D. W. (Lavyn Wright) Sisco wrote6 that Ed "made sure his wife, Mattie, had a new dress or hat. She did enjoy looking nice even when she was a very old lady and was in poor health." FYI William Capers ... was elected a Bishop in the Methodist & Episcopal Church in 1846. The next year, 1847, he was sent to be the first Bishop of the Church in of all places... Arkansas... Coincidence? I don't think so.... I now have a print of what appears to have been an old wood-cut portrait of the good Bishop. He looks rather like George Washington on a dollar bill (a bit more hair though).... One reference to him calls him "...that great messenger of the gospel to the slaves." 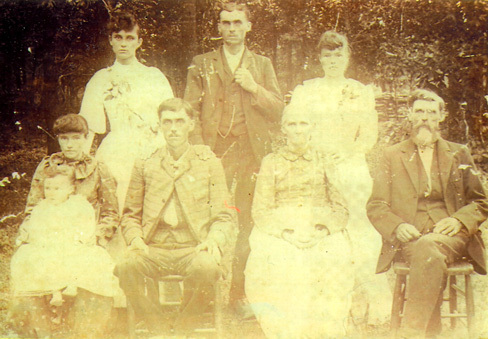 Sometime after the 1880 census, Cape's parents moved the family by wagon train to Grant Co., AR. 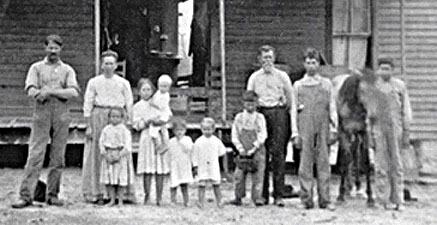 Chip compiled a book, A Collection of Culpeppers 12 which focuses on the Capos Conley Culpepper family and in it 13 Chip notes that Cape was about six or seven when the family moved from Alabama to Arkansas and recalled "how the family landed by flatboat at Pine Bluff in Jefferson County, Arkansas after crossing the Mississippi." 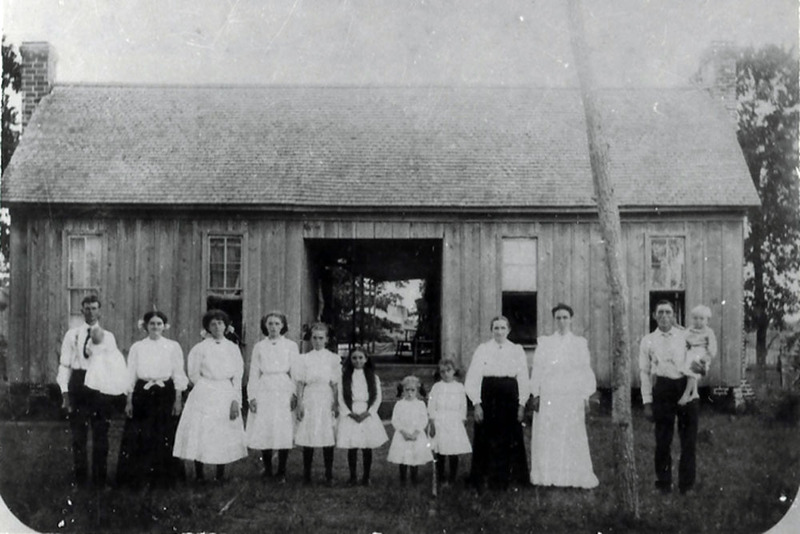 In 1892,14 Cape's parents took him and his older sister, Melvina Miriam, accompanied by their older brother, Luther, and they went by train to Saltillo, Hopkins Co., TX 15 where they settled down in the Pine Forest Community. They were soon followed by the William "Billy" Jehu Culpepper family. Capus came riding up to Billy's home on his horse. Billy's dog came out as usual and as always was barking and yipping at the horse's feet scaring the horse. Capus took a gun he had, reportedly only to scare the dog away but his aim was such on the moving horse that he shot the dog dead on the spot. History does not say what Billy's response was but Chip and I think it was about this time Capus probably decided that Texas wasn't quite big enough for both he and Billy. p 67; location Mrs. Sisco CC Culpepper family group sheet. Conley Culpepper, Son, 6, S, AR/AL/AR. p 67; POB based on 1910 census. Biography* � Malcolm Henry Luther Culpepper was the son of William Jehu and Emily Julia Ann Josephine (East) Culpepper. According to Tommie Smith, "he was one of at least three of his siblings who developed Diabetes that plagued him a long time. His death in 1933 at the age of 44 no doubt was hastened by the disease. Most of his children were close to the age of his youngest sibling, Tessie Lee Sue Culpepper Reeves." Around 1890, the family is believed to have moved to a farm in the Hurricane Creek area of Grant Co., AR and Mack would presumably have accompanied his parents.13 Unfortunately, the 1890 U. S. census records were burned. 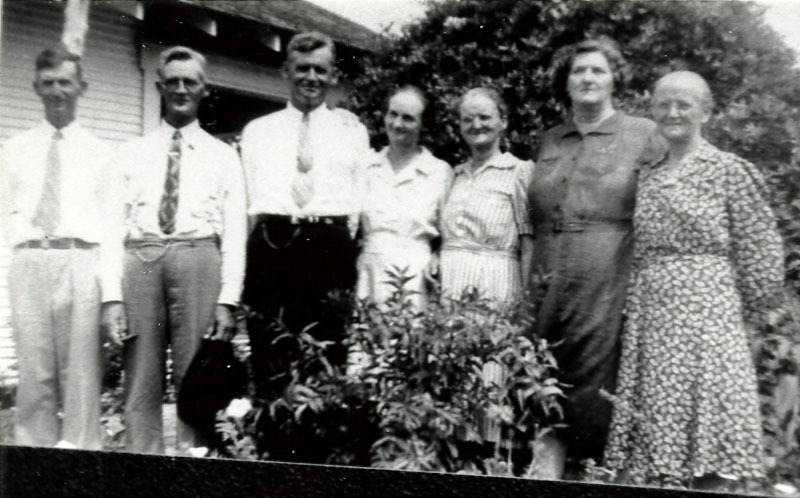 In the mid-1890's, Mack's parents moved again, this time to Hopkins Co., TX. Again, Mack appears to have accompanied his parents and this is apparently where he met Elba Louella McGill whom he married in 1899. Jas B. Culpepper, Brother, M, Jan-1879, 21, S, AL AL AL, Farm Laborer. Beckie Harris, G-Mother, F, 57, wid, MS TN TN, Own Income. Malcolm Henry Culpepper, RFD#3, Como, Hopkins Co., Texas, age 41, born 14 Dec 1876, Caucasian, Farmer for self, Nearest relative: Elba Louella Culpepper, RFD#3, Como, Hopkins Co., Texas, Tall height, Stout build, Blue eyes, Dark hair, No disabilities. Registered 12 Sep 1918 at Sulphur Springs, Hopkins Co., Texas. Mary J. McGill, Mother-in-law, F, 77, Wd, AL/AL/AL. Malcon Henry Culpepper, Bowie Co., Apr 29 1933, 16712. Death Certificate of Malcom Henry Culpepper born Dec 14, 1876 Alabama; Died April 29, 1933 Bowie County, Texas Residence: Red Water, Bowie, Texas; Male White Married, spouse: Elba Culpepper; 56 years 4 months 15 days; Farming; Father Billy Culpepper, Alabama Mother: Jsie East, Alabama. 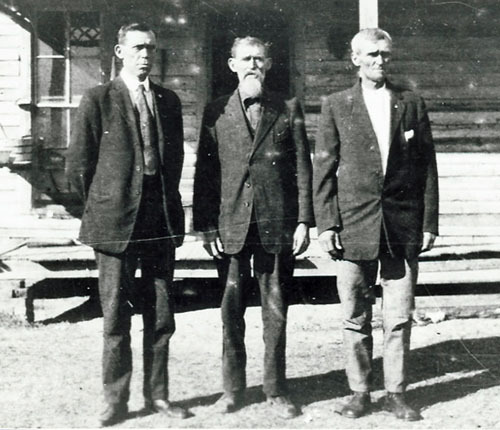 Informant: F D Culpepper, Picton, Texas; Place of removal Pine Forest 4/30/1933. Death Certificate of Elba Louella Culpepper born July 31, 1881 Alabama Died June 9, 1947 Rt 5 Texarkana, Bowie, Texas diabetes. Female White Widowed , 65 yrs 10 months 9 days; Residence Rt 5, Texarkana, Bowie, Texas; Father: Daniel McGill, Alabama Mother: Martha Harris, Alabama; Informant: Mrs. Annie Endsley, Texarkana; Diabetes, Hypertension cystitis. Burial Sulphur Springs, Texas 6/10/1947; Hanner Funeral Service, Atlanta, Texas. 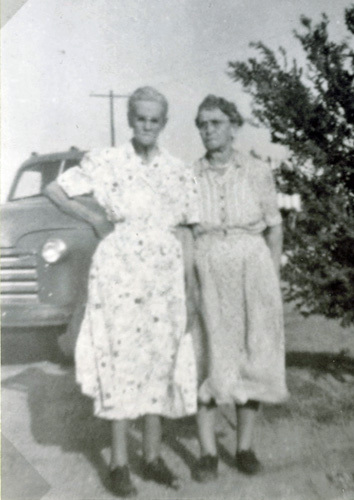 Elba Louella Culpepper, died 9 Jun 1947 in Bowie Co., TX. 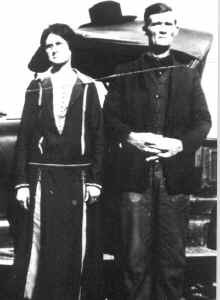 Marriage* 9 Nov 1902� He married Cora Agnes Williams at Hopkins Co., Texas, on 9 Nov 1902 at age 23. Around 1890, the family is believed to have moved to a farm in the Hurricane Creek area of Grant Co., AR and Bill would presumably have accompanied his parents.16 Unfortunately, the 1890 U. S. census records were burned. 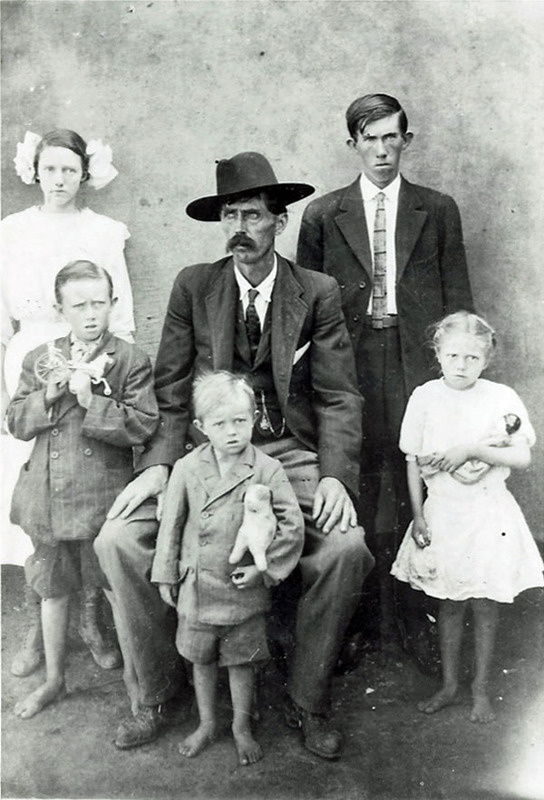 In the mid-1890's, Bill's parents moved again, this time to Hopkins Co., TX. Again, Bill appears to have accompanied his parents and this is apparently where he met Cora Agnes Williams whom he married in 1902. 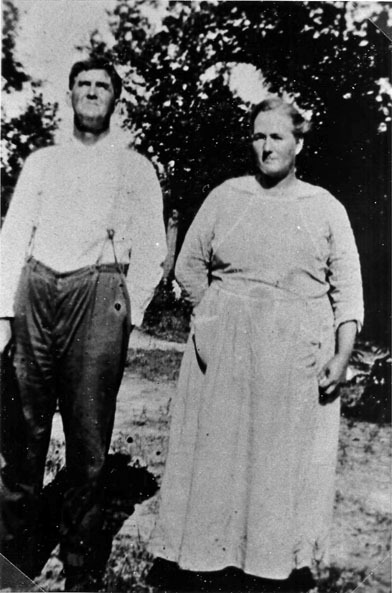 Bill and Cora appear to have settled down to raise their family in Hopkins Co., TX and they were noted there in 1910 and 1920 census records. Bill died in 1970 at the age of 91. Culpeppers have worshiped there through the years. The present sanctuary was built in 1957 when I was a teen. As it was being built with a steeple one of the laymen mentioned to John William Culpepper ( Billy and Josephine) that they needed to obtain a bell. Uncle Will Culpepper indicated that was no problem, that he had one. He presented the bell that had hung on the farm of Billy and Josephine Culpepper summoning the family for meals for years. The bell was hung in the steeple and remains there today. On the day of the dedication it was arranged that someone ring that bell for all to hear at precisely 2:00 P.M to start the ceremony. It was spine tingling for me and no doubt for other Culpepper descendants present." Cora A. Culpepper, Wife, F, 45, M, md@16, KY KY KY.
Funeral was held at Pine Forest Methodist Church. 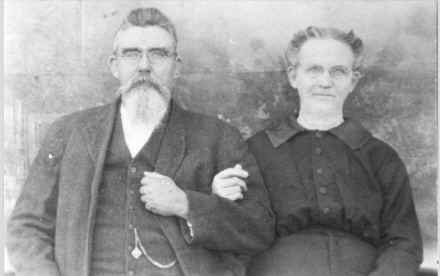 Marriage* 9 Nov 1902� She married John William Culpepper at Hopkins Co., Texas, on 9 Nov 1902. John William Culpepper Sheet (Frank Rettman info); POB census.